A rare find: Instructional resources aligned to your state's learning standards. We are not a "one size fits all;" instead, our content and instructional resources align with the specific domains and standards specified by your state. 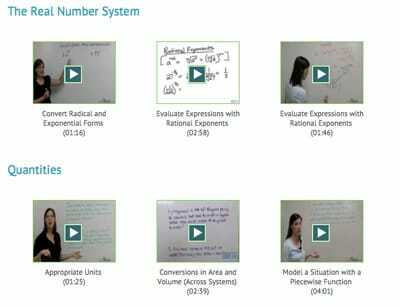 We offer thousands of standard-specific videos, including brief comprehension questions for each one. This is an excellent way to reinforce content when the teacher is out of the classroom or when students are working independently. This is our #1 feature enjoyed by students. We offer one- and two-player games, arcade bonus rounds, classroom games, and more. Select your terms and instantly create a vocab worksheet around a test domain or standard for student practice. These worksheets are great for daily in-class or homework assignments. Our large database of terms allows you to create many unique vocab exercises. Give an assessment to your entire class using a computer and classroom projector. Simply load a set of questions from a previously-created assessment or get a random set of questions selected from the domain or element level. All of the keys, passages, and student answer sheets can be printed if you prefer to pass out a hard-copy assignment. Our printer-friendly, standards-aligned puzzles are complete with clues and answer keys. Teachers and students can access both crossword and word-find puzzles. The vocabulary for each puzzle is carefully matched to the appropriate test domain. Choose your vocabulary terms and generate a set of flashcards for your students to practice with. Flashcards can be created to laser focus on specific domains. Choose from hundreds of printable classroom resources for each test review. This vault includes labs, Venn diagrams, ordering, and many other activities designed to challenge your students in diverse ways. Practice standards with a randomly selected test question, vocab term, or instructional video each day. Display a single question for your students to answer and discuss at the start or end of class. You can choose from multiple choice, short answer, vocabulary, or free response questions. Encourage in-class competition by making a custom scoreboard with data from your classes. You can customize the scoreboard using the filters shown. Then, periodically regenerate your custom board as students jockey for new positions.